Welcome to the Fall into Fantasy Hop hosted by I'm a Reader, Not a Writer and The Write Path, running October 16th-21st. For this hop I'm giving away either a signed physical copy or audio copy of my vampire book, The Emerald Talisman, winners choice. Also coming up is a chance to win $100 with the Emerald Talisman Blog audio book blog tour! Come back on October 22nd to find out MORE! I'd love a copy! Sounds fun. This sounds like a great read! Thanks for the chance to win it! The book sounds great, I think this just may be me but the cover reminds me of the cover for the new Taylor Swift album. Thanks for having the giveaway! I'd like to win the physical copy of the book, sounds like a great read. Thanks for the chance to win! 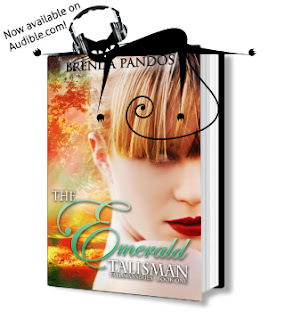 THE EMERALD TALISMAN looks like a fabulous read. I'd love a print copy thanks. I'd love to win the audiobook, thanks!! Thanks for the great blog hop. Thank you for the giveaway! This book sounds awesome!